Last weekend I went to London to visit my sister and of course I couldn’t go to London without doing a bit of shopping. My dad drove down to London, meaning I had more room in the car to buy bigger things such as the copper basket from H&M (£12.99) I have wanted this for a long time now but I had always gone down to London on the train and didn’t want to have to carry it. I also got a marble ceramic mug (£4.99) I am going to use this to put my makeup brushes in. Every single time that I go to London I always visit Guru Makeup Emporium and I always ask if they have Ben Nye Banana powder (£10.95) in stock and every time they say its out of stock. This time however I finally managed to pick one up, I am so excited to start using this. 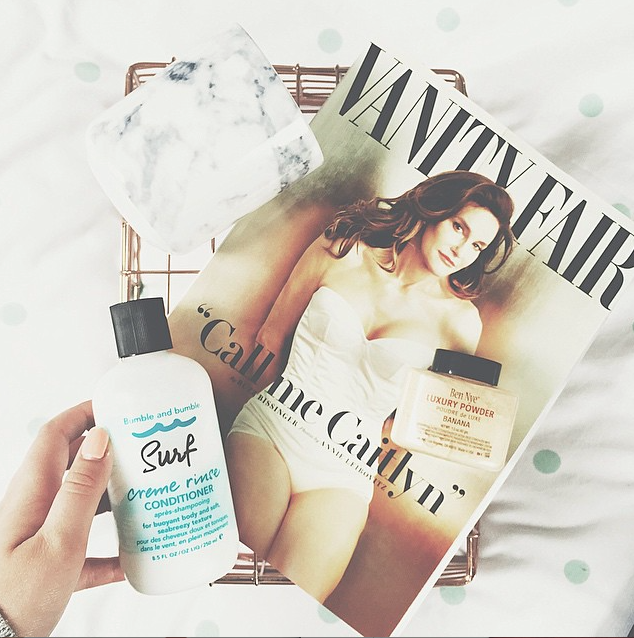 I also managed to pick up a full sized bottle of Bumble and Bumble surf creme rinse conditioner (£20.50) I tried the travel size of this collection last year and I wanted to get the bigger bottle for my holiday on Tuesday. Finally I got my hands on this months Vanity Fair magazine with Caitlyn Jenner on the front. I have already started to read the interview inside and it is truly inspirational, I can’t wait to read the rest.